The Great Northern 9 ton 15 foot long open wagon, four planks high with a 9’6″ wheelbase was introduced sometime in the 1870s, and was very much the Company’s standard for many years, eventually numbering over eleven thousand. This morning our much-burdened postie staggered down the drive with a large box of goodies. Practical model making has been impossible for quite a number of months (a situation now coming to an end, at long last! ), and during my time away from home I’ve spent a lot of hours deciding exactly which stock for Basilica Fields, not already secured in the Tardis one of the bulging cupboards, is my priority for getting Artillery Lane up and running. The GNR 4-plank wagon was a key ingredient on that list, so about a month or so ago I fired off an email to CMA Moldings to enquire about the feasibility and cost of a run of GNR 4-plank wagons, but before I had a reply an email arrived from Tony West alerting me to the latest resin wagon from S&T Wagon Works – you guessed it, a GN 4-plank! When the quote returned from CMA it was plain to see that S&TWW won hands down when considering both the time of constructing the master to spec and the cost together. 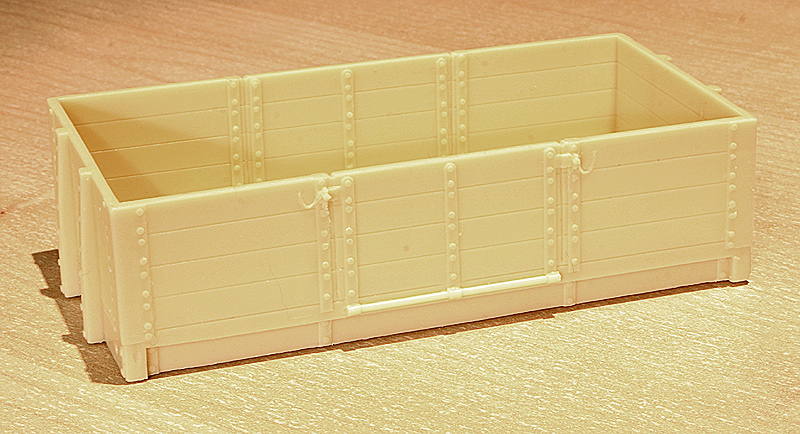 Those of you who’ve had wagons from S&TWW before will know what to expect – a detailed (inside and out) resin body, and (usually) all the necessary castings to make a nice working model. Back to this morning; opening the box, 16 individually wrapped bodies were snugly packed in bubblewrap. On this occasion S&TWW are unable to supply the running gear for the wagon, but I’m not too fussed about that as ABS can supply the necessary axlebox/axleguard irons and brake gear, though I’m also considering having some etched parts made (one day!) for sprung axleguards. However, buffers (sprung ones of the correct ribbed profile from Haywood) and couplings are provided. I noticed a little inwards-bowing of the sides on a few of the castings, but nothing that can’t be fixed with a wooden brace or two and a pan of hot water on the hob. I understand this is a run of 50 which may not be repeated, so if you want some, now is the time, and procrastinators will kick themselves. 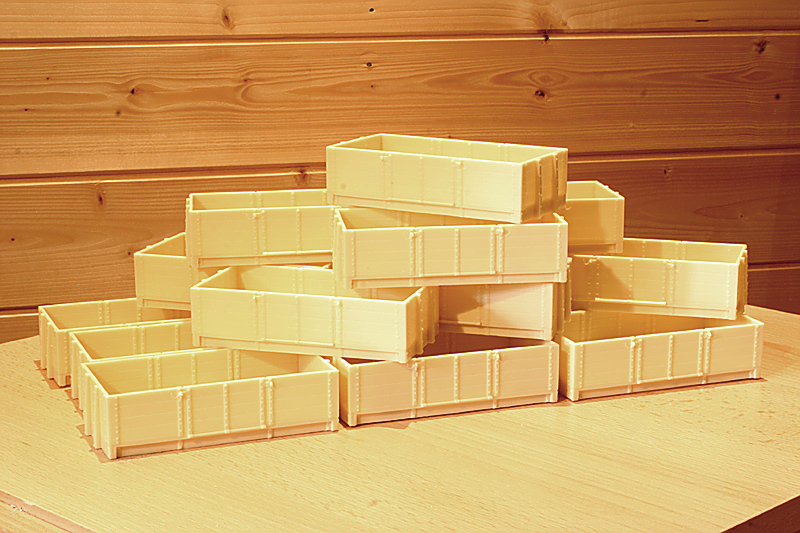 A phone call to Simon Spare on 01455 233372 (evenings) will secure your wagons which cost £18 a piece plus postage. The prototype photo shows no.33225. It is a product of its time, being fitted with grease axleboxes, plain spoked wheels and 4-rib buffer housings. The plate at the left hand of the curb rail reads, ‘Load 10 Tons / Distributed’. In the period of Basilica Fields, many, such as the one illustrated, were fitted with opposite-hand Morton brakes with both levers at the same end of the wagon and no reversing mechanism between either of them and the cross shaft – a system later banned by the Board of Trade. The levers operated two brake blocks located on diagonally opposite wheels. Over the years there were many variants, some (such as this example) were uprated to 10 tons, some were fitted with Williams’ sheet support bars, some with vacuum brakes, screw couplings, and even a vegetable frame! Ordinary goods wagons were painted oxide brown, I’ve seen some GN models painted in oxide red, but received wisdom suggests the colour was warmer and slightly more orangy-brown, and sometimes referred to as ‘chocolate’. 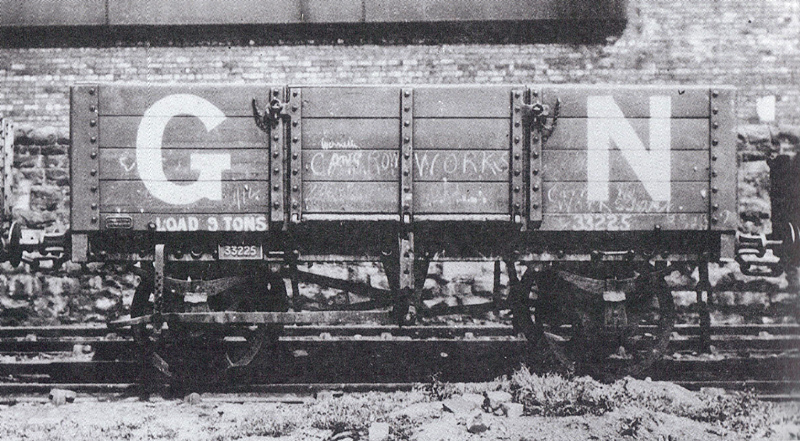 Until 1898, new wagons were lettered on the left hand side G Northern R in white serif characters, the initials being 6″ high and the other letters about 5″. These were often in a cross shape with the G and R above and below the T of Northern. The number was was painted on the right hand side of the wagon, and the load restriction was often on the lower left curb rail, also in white but of thinner lettering. A rectangular plate was affixed to the solebar with the initials GNR and the number below, picked out in white with a border. A tare and last painted date was also on the solebar. In 1898, new large initials were introduced, these were as large as possible up to a maximum of 30″ high. Of course it took many years for the earlier lettering to be phased out completely, and so most of those on Basilica Fields will have the earlier lettering, with just one or two ringing the changes. OK S&TWW, we now need a contemporary GN covered van alongside!